This is another very insightful article by Dr. Salla, and he draws from the video displayed in the last Kp blog post. I also found it fascinating where he pointed out that the number of military people on the left of the center trio (Mattis, Trump, Pence) is 9, and the number to the right of the trio is 11. “9-11″… get it??? “According to veteran investigative reporter and best selling author, Dr. Jerome Corsi, he was approached three years ago by a group of generals and told that Donald Trump had been recruited by U.S. military intelligence to run in the 2016 Presidential elections, and subsequently help remove corrupt Deep State officials from positions of power. Corsi claims that QAnon represents the same group of senior military intelligence officials who are exposing the Deep State corruption and officials involved in a history of treasonous actions against the U.S. Republic. 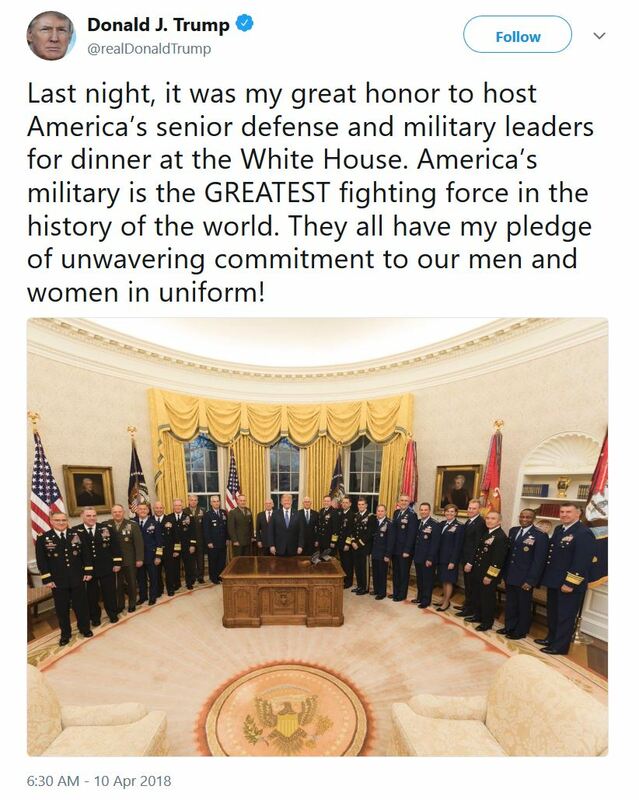 “It’s important to note that Corsi’s speech happened only a day after a tweet by President Trump featuring him with 20 senior U.S. military officials who dined with him the previous night… In the photo, the man next to Vice President Pence and Trump is Admiral Michael Rogers, the head of the National Security Agency. It was Rogers who travelled to Trump Tower on November 17, 2016, a week after the Presidential election, without the knowledge of his superiors in the Obama administration. “It would be fair to conclude that QAnon is acting with the approval or support of Admiral Rogers, and that intelligence data is being anonymously leaked to expose the extent of Deep State corruption. 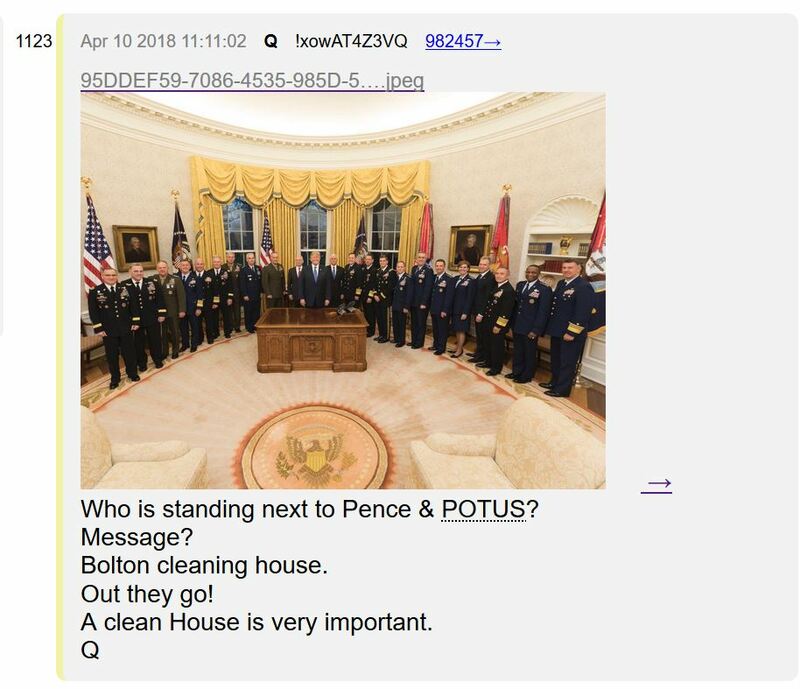 “Another interesting aspect of the photo tweeted by Trump showing him, Pence and Secretary of Defense, James Mattis, flanked by 20 uniformed military officers, is that 9 were on his right, and 11 on his left. Was this symbolism for the 911 event…? “According to a November 2, 2017 post by QAnon, if Hillary Clinton had won the election or results were overturned in her favor, a military coup would indeed have occurred given her level of corruption… As mentioned in my previous article, the Clintons’ corruption began with Bill’s term as Governor of the State of Arkansas, where he supported CIA drug running operations out of Mena, Arkansas. “As Bill’s Presidency was coming to an end, Hillary’s rise to high political office was made possible, according to QAnon, by the CIA assassinating John F. Kennedy’s Jr., who was a threat to her plan to run for New York’s open US Senate seat in the November 2000 election… If Clinton had indeed been helped in this sinister way by the Deep State, it is easy to understand how important she was to their future plans, and how deeply compromised she was. “The level of information on Deep State control and corruption released by QAnon in over 1100 posts to date is astounding in its scope and impact. A number of false flag events have been revealed, the most significant being a January 13, 2018 nuclear ballistic missile attack against Hawaii, which was intended to start a major regional war. The knowledge that these revelations are coming from senior military intelligence officials working closely with the Trump Administration to overcome the corrupting power and influence of the Deep State is highly significant. “About three years ago a group of Generals came to me, and it was explained to me that they were ready conduct a coup d’etat. They were ready to move Barack Obama from office with military force. And then a few weeks later I got another call and said they were reconsidering. “You know why they were reconsidering? [audience calls out answers] Because they talked to Donald Trump, and Trump had agreed he would run, and they agreed that if he would run, they would conduct their coup d’etat as a legitimate process, rooting out the traitors within government. And that pact between the military and Donald Trump has held, as we have been interpreting and watching, and Alex has been following QAnon. Gallery | This entry was posted in apocalypse, cabal, disclosure, energies, new energies, partners in contrast and tagged Deep State, Dr. Jerome Corsi, Exopolitics.org, Hillary Clinton, Michael Salla, President Donald J. Trump, Q, Q Anon, The Alliance. Bookmark the permalink.